Orthopedic surgeon, Arthroscopist, Ozone therapist & Ilizarov Surgeon, with over 25 years of experience. 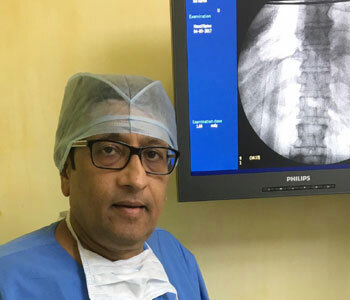 First Indian Orthopedic surgeon to learn the Ilizarov technique! First Orthopedic Surgeon in Asia to use Ozone successfully in Orthopedic conditions! Over 3 decades of experience. Passed post-graduation in '84 from GMC, J J Hospital, Mumbai. Trained in Arthroscopy surgery in Germany by Prof. T. Witwitty and in USA by Dr. Stuart Springer & Dr. Dinesh Patel. First Indian Orthopedic surgeon to learn the Ilizarov technique from Dr. Ilizarov himself, in 1988. Dr. Prasham Shah is the first Orthopedic Surgeon in Asia to use Ozone successfully in Orthopedics! Over 600+ cases handled, with maximum follow up of 4 years! First Indian Orthopaedic Surgeon to use this time-tested Russian method to treat fractures, non-unions, deformity correction & limb lengthening. We do joint replacement for shoulders, knees and hip joints with minimal invasive techniques and the best of implants are used. Arthroscopy surgery is mainly done for sports injury in the knee, for meniscal surgery & ligament surgery. Solve your slip-disc problems without undergoing surgery by using intra-discal injections as OPD procedure! I was experiencing severe pain in my neck for which I showed many doctors but I could not get relief from any of the medicines given by them.On the contrary there were side effects on me due to heavy dosage.I also tried physio therapy but that was also of no use. I had also developed weakness in my elbow and hand due to which I could not perform my daily routine. I could not sleep for almost a month & half when I got recommended to Dr. Prasham shah by one of my relative. Doctor recommended that I go for injection of ozone which will avoid surgery to which after some thought I agreed as I had full faith in the doctor. I would like to add that after the injection which was painless I could sleep after one & half month which really increased my faith in him as what so many doctors could not do after so many visits. My hand and elbow started functioning normal after 5 days of injection. After ozone injection & initial period of care I felt really nice about my self. After so many days I was living my life pain free & returned to live my life in my normal routine. For that I would like to thank doctor as with out him this would have not been possible. I'm a housewife. I started experiencing sudden dropping of my wrists! From Dr. Prasham Shah, I found it out to be a cervical spine issue. He was confident that ozone therapy would get my wrists back to normal. I tried out the therapy and true to his word, within 2 weeks, my wrists were back to normal! And I can do all my work without any problems! I'm a young woman of 24 years. I developed a L5-51 spinal disc problem. I simply could not lift anything or bend at all! I was scheduled to leave the country and go to the Canadian Rockies. I was shattered! Then I learnt about Dr. Prasham Shah and the Orthocare Centre. The therapy sounded convincing, I decided to try it out. One injection, two hours in hospital and that was it! Within 10 days I was back to normal! And I went to the Rockies and even indulged in sky-diving.. without a problem! Thanks, Prashambhai! I'm Mussavir Vaid, a body-builder by profession. I suffered from a cervical spine disk problem. Due to which I had paralysis of my limb in my left hand. In a span of one months I met 4 orthopaedic surgeons. All suggested that I must go for an operation of my cervical spine disk. A metal disk would be inserted. Not only an expense of 4-5 lakhs was estimated but also that I would not be able to go to the gym anymore! That's when I heard of Dr. Prasham and came to Orthocare Centre. In a procedure lasting 20 min, I was administered an Ozone injection. And allowed to go home after a couple of hours. Within two weeks I could lift 15kgs and within two months, my deltoid muscles had started shaping up. And now I'm back to gymming and lifting 120kgs!